Cute - isn't it - but it doesn't fit. The pattern is inspired by Cayote and Cactus Top, found in the book "Slip-Stitch Knitting" by Roxana Bartlett. I did some reworking so that the graph would work in the number of stitches I needed. So now I have knit them twice and ripped them back again. 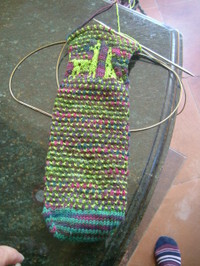 The thing is that a mosaic pattern with long floats significantly affects the size of the sock. DUH. .... and how long have you been knitting?!!!? Anyway, I reknit this sock last night from the heel up, and increased the stitches, and the needle size. They are now offically going to be called "SW Cactus Dog SLOUCH socks". Who knows how they will fit. I'll just have to wait and see once the heel is inserted. New photo will follow of the reknit sock.